The Chinese New Year falls on the first day of the lunar calendar. One of the main ways people celebrate is by setting off firecrackers at midnight. In New York City it's illegal for individuals to set off fireworks. So there is a formal New Year's Day Firecracker Ceremony & Cultural Festival organized by several Chinatown-based organizations in New York City. In addition to setting off rockets and firecrackers, there are lion dances, drumming, and dancing. Many community organizations have booths at the festival. Some offer giveaways or contests. Others sell traditional Chinese New Year items. After the Firecracker Ceremony there is a parade through the streets of Chinatown that begins at Sara D. Roosevelt Park. It's a great way to mix with the locals; many families participate in the festivities, and residents from all over New York City gather to watch the spectacular celebrating. It's a treat for the eyes. It gets crowded. Arrive by 11:15 a.m. for the best viewing spots. Dress warmly. You'll be standing in one spot waiting for the firecrackers, so it's easier to get cold. February tends to be one of the colder months in New York City. Bring hats, scarfs, and gloves. Note: There will be lots of noise and smoke. If you're sensitive to this, you should choose a location that isn't too close to the events. This is something to keep in mind if you're attending the event with children. 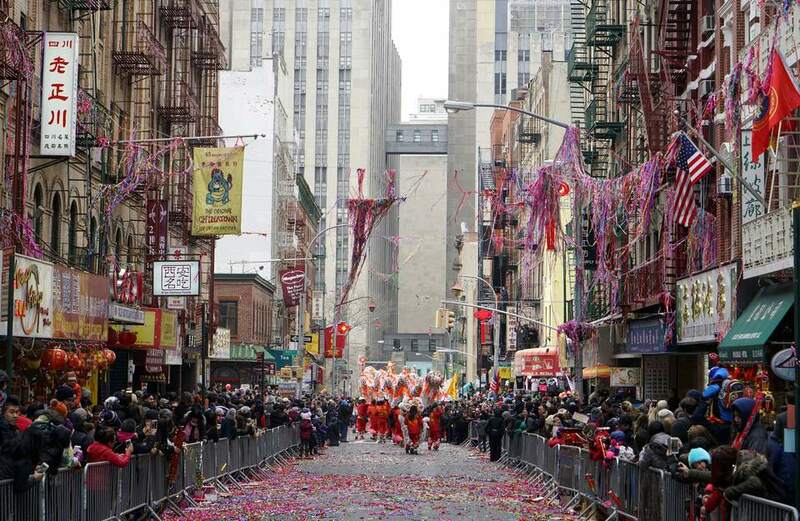 Many restaurants in Chinatown are closed on New Year's Day. If you have your heart set on dining somewhere in particular, you should call ahead. Or plan to head out of the neighborhood for a meal afterward. (There are lots of great places to eat nearby on the Lower East Side or in SoHo. The festival is held in Sara D. Roosevelt Park. The Park runs from Canal to East Houston between Forsyth and Chrystie Streets. Take the 6 train to Canal Street and walk east along Canal Street past the Manhattan Bridge and take a left on Chrystie Street. The events are held between Grand and Hester Streets. Street parking in Chinatown is very difficult. Taking public transportation or utilizing a parking garage is highly recommended. What's Open and What's Closed on New Year's Day in Brooklyn?